The rapid advancement of technology, such as artificial intelligence (AI) and robotics, has impacted all industries, including education. Artificial intelligence is being applied successfully in several educational instances, and improves learning and student development, as well as the educators’ performance. Emotional well-being:17 A child’s emotional state affects how well or poorly they are able to focus, engage and stay motivated to learn. With this in mind, a team from the Department of Artificial Intelligence in Madrid, Spain, led by Dr Imbernon Cuadrado are working on a robot called ARTIE (Affective Robot Tutor Integrated Environment). ARTIE’s chief role is to identify the emotional state of a student through keyboard strokes and mouse action, and then, by running an algorithm that chooses the most appropriate intervention required, give the student personalised educational support. These range from encouraging words, to gestures, or attempts to increase the students’ interest and motivation towards a certain learning goal. 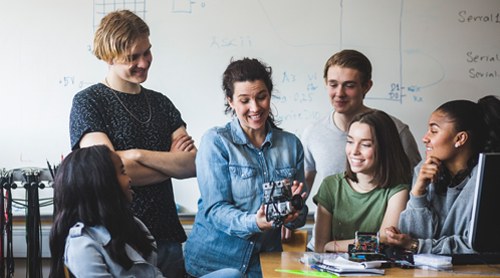 ARTIE’s design team have focused on three cognitive states: concentrating, distracted and inactive, and have found that the social support behaviours provided by these robot tutors have positively impacted these students’ ability to learning. Spotting and filling the gaps:18 Artificial intelligence can identify the gaps in a teacher’s presentation and educational material. The teacher is alerted by the system when a large number of students submit an incorrect answer to a homework assignment. The teacher can then provide hints to the correct answer for future students in order to improve the conceptual foundation of learning for that topic going forward. Children working alongside AI:19 Nao is a humanoid robot that talks, moves, and teaches children from ages seven and up everything from literacy to computer programming. Nao engages children in learning STEM subjects, and provides a fun coding lab for students. 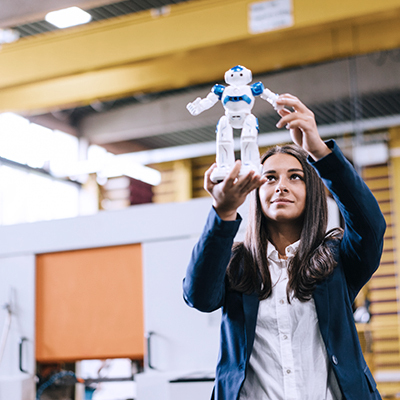 This introduction to basic coding allows students to instruct the robot to perform certain things, such as hand gestures, emotional movements, and even choreographed dances. This way, students get the opportunity to become familiar with telling a robot (or program) to do the tasks they want to be done, and better prepares them to apply and train AI in the future. These educational applications harness the power of AI to improve learning in students of all ages – from primary school through to college – and empower both learner and teacher with more avenues for reaching their educational goals. Thinkster Math:20 Thinkster Math is a tutoring app that blends real math curriculum with a personalised teaching style. They use artificial intelligence and machine learning in their math tutor app to visualise how a student is thinking as they work on a problem. This allows the tutor to quickly spot areas in a student’s thinking and logic that have caused them to become stuck, and assist them through immediate, personalised feedback. Brainly:21 Brainly is a platform where students can ask homework questions and receive automatic, verified answers from fellow students. The site even allows students to collaborate and find solutions on their own. Brainly uses machine learning algorithms to filter out spam. Content Technologies, Inc.:22 Content Technologies, Inc (CTI) is an AI company that uses Deep Learning to create customised learning tools for students, such as JustTheFacts101, where teachers import syllabi into a CTI engine. The CTI machine then uses algorithms to create personalised textbooks and coursework based on core concepts. Cram101 is another example of their AI-enhanced offering, where any textbook can be turned into a smart study guide, providing bite-sized content that is easy to learn in a short amount of time. It even produces multiple choice questions, saving students time and helping them learn more effectively. MATHiaU:23 Similar to Thinkster Math, Carnegie Learning’s MATHiaU offers AI-based tutoring tools for higher ed students who feel lost in lecturer-sized classrooms. The app is guided by each student’s unique learning process, keeps them aware of their daily progress, and helps teachers tailor lessons to meet each student’s specific struggle. Netex Learning:24 Netex Learning allows teachers to design and integrate curriculum across a variety of digital platforms and devices. The easy-to-use platform allows teachers to create customised student content that can be published on any digital platform. Teachers also get tools for video conferences, digital discussions, personalised assignments, and learning analytics that show visual representations of each student’s personal growth. Preparing students to work alongside AI in the future can start early. 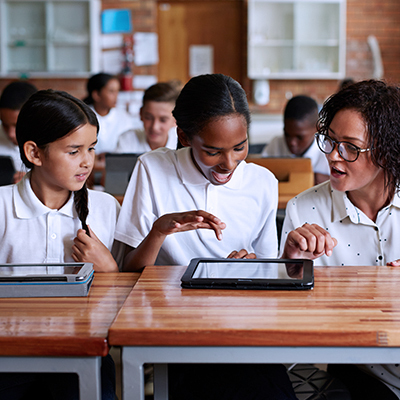 As most children are comfortable with digital technology by the time they are of school age, teaching them the skills they’ll need to thrive in a digital workplace is important.27 Add the inclusion of AI in education, and the workforce of the future will be better prepared to face the unknown challenges of the workplace of tomorrow. 1 (Nd). ‘How has education changed over the past decade?’. Retrieved from Baltimore Consulting. 2 (Nd). ‘How has education changed over the past decade?’. Retrieved from Baltimore Consulting. 3 (Nd). ‘How has education changed over the past decade?’. Retrieved from Baltimore Consulting. 4 Kirkland, R. (Apr, 2018). ‘The role of education in AI (and vice versa)’. Retrieved from McKinsey. 5 (2018). ‘The quant crunch’. Retrieved from IBM. 6 Vincent, J. (Dec, 2017). ‘Tencent says there are only 300,000 AI engineers worldwide, but millions are needed.’ Retrieved from The Verge. 7 Metz, C. (Oct 2017). ‘Tech giants are paying huge salaries for scarce AI talent’. Retrieved from NY Times. 8 Lynch, M. (Aug, 2017). ‘Is artificial intelligence the future of education?’. Retrieved from The TechEdvocate. 9 (Aug, 2018). ‘Artificial intelligence market in the US education sector 2018-2022’. Retrieved from TechNavio. 10 Lynch, M. (Aug, 2017). ‘Is artificial intelligence the future of education?’. Retrieved from The TechEdvocate. 11 (Oct, 2018). ‘Class of 2030’. Retrieved from Microsoft. 12 Marr, B. (Jul, 2018). ‘How is AI used in education: real world examples of today and a peek into the future’. Retrieved from Forbes. 13 Nelson, K. (Jul, 2018). ‘The future of artificial intelligence in education’. Retrieved from TechWell. 14 Marr, B. (Jul, 2018). ‘How is AI used in education: real world examples of today and a peek into the future’. Retrieved from Forbes. 15 Nelson, K. (Jul, 2018). ‘The future of artificial intelligence in education’. Retrieved from TechWell. 16 Nelson, K. (Jul, 2018). ‘The future of artificial intelligence in education’. Retrieved from TechWell. 17 (Apr, 2017). ‘ARTIE: The robot tutor helping students achieve their best’. Retrieved from Evolving Science. 18 Verma, M. (Jan, 2018). ‘Artificial intelligence and its scope in different areas with special reference to the field of education’. Retrieved from Educational Journal. 19 Nuse, I. et al. (Sep, 2017). ‘Humanoid robot takes over as teacher’. Retrieved from ScienceNordic. 20 Sennar, K. (Feb, 2019). ‘The artificial intelligence tutor – the current possibilities of smart virtual learning’. Retrieved from Emerj. 21 (Nd). Retrieved from Brainly. 22 Turbot, S. (Aug, 2018). ‘Artificial intelligence in education: don’t ignore it, harness it!’. Retrieved from Forbes. 23 (Apr, 2017). ‘Carnegie Learning selected as middle and high school math curriculum provider for Wichita public schools’. Retrieved from Business Wire. 24 Couture, W. (Mar, 2018). ‘How AI is disrupting education’. Retrieved from Disruptor Daily. 25 (Jan, 2018). ‘The future of jobs report 2018’. Retrieved from World Economic Forum. 26 (Oct, 2018). ‘Class of 2030’. Retrieved from Microsoft. 27 Bramley, N. (Sep, 2017). ‘Preparing students for the workplace of the future’. Retrieved from EdTechnology. 4 min 21 June 2017: Mary Meeker, from Kleiner Perkins, has just released her Internet trends report for 2017. There are 355 slides in this pack, mostly for those concerned with digital sales.